I am pleased to announce that we have brought our hospital extensions in line with the latest code, and that it is now available for testing. It can be downloaded from my github site at https://github.com/timschofield/KwaMoja/tree/KwaMoja-Medical. This code by itself can be used in small clinics where it is just necessary to track what treatment a patient has had, and do the financials, or it can be used together with Care2x (http://www.care2x.org). On installation you should find that you have another module called "Hospitals" installed. This module contains all the options for billing patients, dealing with the insurance companies, and reporting on the hospitals activities. Using these extensions will provide a great help in tightening up a hospitals financial activities, and considerably help to reduce fraud. A brief description of how this works is given below. Each cashier has a petty cash account that is just for their use, and which can be restricted to just them and a senior accountant/cashier to use. 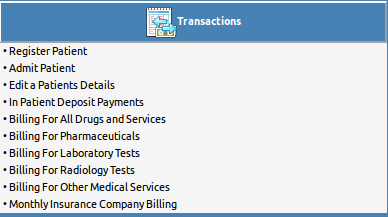 The Hospitals module contains options to bill from various hospital departments. will be shown, together with the total amount to be paid, so that all the cashier has to do is to collect the cash from the patient, and click on "Make Payment". If the Care2x link is not activated then the patient should present the cashier with a document to show what Laboratory test they have been prescribed. The cashier then selects this as follows. When the lab test is selected the price for that test is automatically pulled from the system. This depends on what price list was selected for that patient. Any number of price lists can be setup and selected for the patient. The cashier can select as many tests as needed, and the total amount payable is automatically entered in the "Amount Received" box. When the cashier clicks on the "Make Payment" button all accounting and stock transactions related to this payment are automatically done using pre determined parameters. At the end of the shift the cashier prints out a transactions report for their cash account, and the total of that list must agree with the total amount of cash that the cashier has collected. This list together with the cash is then taken to the chief accountant/cashier who verifies that the cash agrees with the report, and then does a transfer of cash from the cashiers account to the main account, which makes the balance of the cashiers account zero, in preparation for their next shift. The chief accountant, or other authorised person then produces a report of any laboratory tests that were prescribed but have not been billed, and any items shown on this report need to be analysed to see why they have not been billed. There are various other reports and configuration options available which there isn't space to go into right now, and I will try to publish another article on these. Thank you....thousands and thousands of people will make use of this project.. Good deeds never die..
thank you sir but how can i get this hospitals module? i installed this script and login but there is nothing like hospitals. Is there any way to activate the hospital module?